I read a book called “Blogging Heroes” and can safely say that I now know the ultimate secret of blog success. 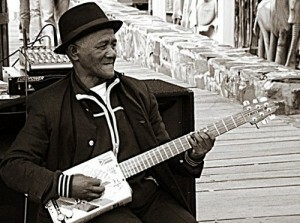 When I blog, I am like a guitar-playing busker on Granville Island on a cool autumn weekday. I do my thing, and occasionally someone stops by to watch. The odd person might leave a few cents in my guitar case, and sometimes I play for no one but me. Either way, I am having fun and doing something that I enjoy. It is also a time for me to practice and hone my skills at my hobby. Will I ever be a rockstar, playing for a huge audience that pays $100 a ticket to see me? It might be nice in some ways, but it is a fantasy that lies far away and seemingly out of reach. To get into the minds of those blogging “rockstars” out there, find out how they think, what makes them tick, and how they got to where they are, I bought “Blogging Heroes,” and read it from cover to cover. “Blogging Heroes” contains interviews with 30 of the top and most prominent “rockstars” of blogging. It is an ideal book for the busker like me who wants to gain insights into what it takes to build a successful blog that is visited by the masses. When asked their opinion on the secret of a successful blog, every one of the 30 blogging heroes gave a similar response. If 30 of the web’s most successful bloggers cite the same secret of blog success, then it truly must be the ultimate secret of blog success. Every single one of the 30 most successful bloggers on the web cited passion as one of the most important ingredients of a successful blog. This means, to increase your chances of having a blog that is a success, you should find a niche in a topic area that you are absolutely passionate about, and blog away about it with consistency and passion. If your passion for the topic shines through, people will notice, and they will come, and come again. Going back to my guitar-playing busker analogy, if you see a busker just strumming some random chords nonchalantly, and he looks like he is only strumming there to try and make some cash, you are likely to just walk right by without a glance. If the busker is really playing with his heart, on the other hand, and really beating out those chords with a passionate expression on his face, you might just get interested and stop and listen for awhile. The niche aspect is important too, because there are a lot of blogs out there and just about every topic in the world is covered (blogs about bacon notwithstanding). The popular, broader topics are covered by many well-established blogs, making it harder to break into those areas. If you take the example of a social media blog, a very narrow niche blog would be a blog that focuses solely on Facebook and covers all things Facebook. The Dad Jam is about fatherhood and parenting, but it could be much more specific than that. There are many parenting and fatherhood blogs out there, and a lot of good ones at that. A fatherhood blog that focuses on how fathers can be more green, or one that focuses specifically on fathers raising sons, are examples of very narrow niche fatherhood blogs that could be successful. What does this all mean to me? I am passionate about fatherhood and being a good dad and husband, so I chose the right topic for this site (although I could have gone into a narrower niche). I hope my passion about this topic shines through in my articles and that it gives my passersby something to stop, look at, and think about. Whether or not I gain a huge following will be something that only time will tell, and although it would be nice, I still have my day job and I won’t hold my breath. I am happy to just keep on strumming away at my favourite songs, enjoying the cool autumn weather, and hoping that those who do stop by to watch enjoy the show and maybe come back to visit The Dad Jam again. Or maybe they’ll take a free CD by subscribing to my RSS feed . I was drawn to this post when checking a discussion I started at BlogCatalog about blogging success stories — your blog was listed under ‘related blog post’ I agree with your point about passion being a prime motivator. We need to feel good when pushing that ‘publish’ button. However, sometimes bloggers get frustrated by the amount of time spent promoting and writing articles with few readers. Some need more interacton, otherwise they can write a book or private journal. So there are many factors, but passion keeps you in the game long enough to achieve even monetary success. @SBA, thanks for your comment, I agree, interaction is also important and this was also cited by many “rockstars” of blogging as an important factor in blog success. This includes reading what is going on in the blogosphere (many of the blogging heroes subscribe to at least 200 RSS feeds), commenting on other’s blogs, and responding to comments that are left on their own blog. @Allen – contact me using my comment form and we can discuss. Here I am again commenting on your post (again!). I absolutely agree that if you want to be a successful blogger – you must DO IT with passion. There is no point in starting out blogs with meaningless information trying to make a quick buck or two. I haven’t come across a single blog which has tread that path and become successful. Being a fellow “fatherhood” blogger, I can definitely vouch that I am blogging what I’m passionate about – being a father and trying to get better day by day! If not today, one day I will and make the “fellowship of the fathers” proud! Hey My Dad Rocks, I appreciate all your comments, thanks! It is really receiving comments that makes blogging fun and worthwhile. I am glad to hear that you are passionate about fatherhood and blogging about it. When you are passionate, it shows! Passion is the driving force that hurls us ever forward, even when life and our minds tell us otherwise. Without passion, I find most things without meaning or of personal value. Doing something without passion is like blindly going through the motions or forcing yourself to eat a microwave dinner. In short, wasted effort without joy. What is not commented on is that you can find passion in almost anything you do, even if you do not want to do it. For example, washing dishes. Good grief, I hate this chore. But I make it better by injecting something I am passionate about. Specifically, games. I play a little game with myself to see how fast I can wash the dishes or how many dishes I can finish before a song on the iPod finishes. I try to be aware and in the moment in all things in my life so I don’t miss anything. Sometimes that means being painfully aware that what I am doing is of absolute zero worth and has no “fun value” whatsoever. When that happens, I inject passion from other aspects of my life and everything just seems to go better. Heck, I have even found passion in changing my sons’ diapers! My boys and I get some serious quality dad/son time when they are on the table getting a fresh nappy. Songs, stories, tickling, are all on the menu while I do what must be done. Great article, my friend. I am looking into getting the mentioned book from my local book repository. Keep up the great work on the Dad Jam. It doesn’t matter how many readers you have if you find joy in passion of the work itself. Knowing this, you will outlast and rise above the other blogs simply because you come across as real and engage your readers. But, yes, a little bribe in the way of a giveaway always helps, too. Cyrus Kirby´s last blog ..HAPPY FATHER’S DAY! Thanks for your comment Cyrus! Really great points. Indeed, it helps to inject passion into everything we do. Keep on bonding through games my friend!